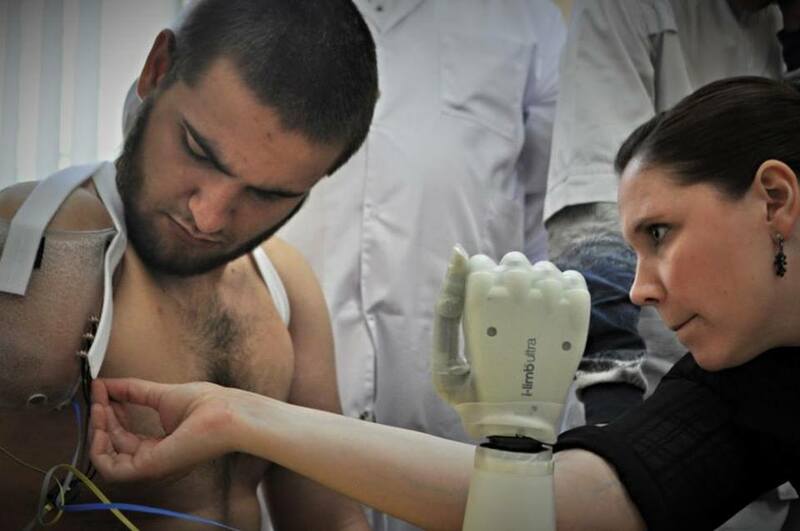 Official statistics says they’re up to 300 – wounded at war in eastern Ukraine who need prosthetic care. With the actual number being most likely much higher it is clear that Ukraine has not faced such massive demand for prosthetic treatment before. Canadian Ukrainians found way to bring U.S. and Canadian prosthetic specialists to Ukraine for two weeks so that they worked to help five Ukrainian amputees and shared their experience with local prosthetists. EMPR talked to participants of this remarkable collective effort. After getting lost in the streets of Kyiv’s Podil district we approach what is supposed to be our destination, stop and start looking for a number plate on the two-storied yellow building. As we stand uncertain we get a sudden confirmation: a man with prosthetic leg with crutches comes out of the door and makes his way down the stairs accompanied by the man who walks him down with a mix of care and interest. The building we reached is a private prosthetic clinic that became a center for prosthetic thought and practice in Ukraine in these two weeks. Antonina Kumka, Ukraine-born citizen of Canada is the one who developed this idea from a thought into a project. 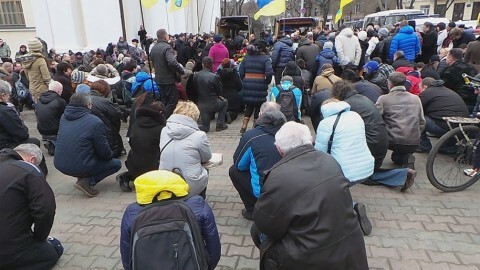 “It all started from a totally different project,” says Antonina, maths teacher and civic activist of Canadian Euromaidan who is helping Ukrainian servicemen as volunteer. “We found way to deliver Kobo e-readers that were later distributed all across Ukraine including to the military hospital.” Antonina’s colleague Oleksandr Romanko was in Ukraine while she herself was in Canada, “he presented many amputees to me via Facebook,” remembers Antonina. “I started talking to them asking what they need and how one could help them. The main request was how to make prostheses abroad as they are not made in a proper way here”. As a first step Antonina turned to the War Amps of Canada – association of military amputees, that in turn advised her to address another organization in the U.S. – Prosthetika that unites prosthetists, rehabilitation specialists and occupational therapists. “They immediately agreed and said they’re ready to start working,” resumes Antonina. 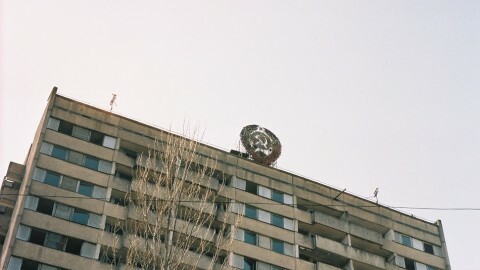 It is the organization whose members arrived in Ukraine. Five patients and nine local prosthetic specialists were chosen to take part in the project. “Main task is not to make prosthesis for five guys and end it right there, but to transfer knowledge, skills and experience to Ukrainian specialists,” continues Antonina. “We gathered prosthetic specialists from across Ukraine: Kharkiv, Khmelnytsky, Lviv, Odesa and Kyiv. Nine in total.” Antonina explains how the patients were chosen: “First of all we asked Ukrainian prosthetists what they wanted to learn. Based on that we chose most complicated cases that include arms prostheses or the cases of very high or very low amputation, or double amputation on one side”. Three of the patients are wounded at war in eastern Ukraine, one more was wounded in course of violent clashes during Euromaidan and a girl wounded in a road accident. The patients were mostly worried about further servicing of their prosthesis. “Regions where the candidates come from coincide with local prosthesists’ geography. We split them by region so that a patient from Lviv will be serviced by a Lviv doctor,” says Antonina. Since the very beginning U.S. and Canadian specialists strived to turn the occasion into a participatory learning opportunity rather than be displaying ready-made prosthetic items. They wanted their “trainees” to make everything with their own hands, to try everything by themselves under their supervision, so that the local specialists are able to use it when they leave. According to Antonina it’s a combination of technology, skills and experience that Ukraine lacks in prosthetics area. “We never had a war before, specialists did not have to deal with such complicated cases as currently exist. Access to some technologies was not open,” notes Antonina. Surely individual producers who wanted to expand their activities used to send their specialists in Ukraine who presented and explained only their components, continues Antonina. Within the current visit of U.S. and Canadian prosthetists to Ukraine the situation is completely different. They do not represent interest of any company, instead show various components of multiple producers and inform of options to use them. According to Antonina the quality of prosthetic components used in Ukraine is sometimes worse, sometimes the same. “Equipment in the clinic that we chose almost corresponds to the equipment they have. They brought with them quite a number of prosthetic components and some prostheses. The total value of the components that prosthetic specialists brought is almost USD 150 thousand. 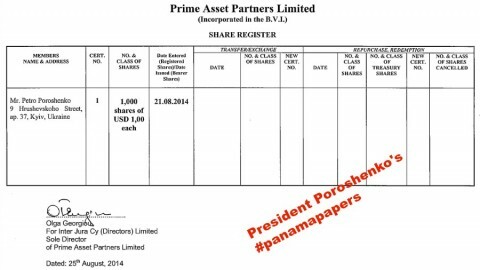 Out of this money over USD 100 thousand was granted by companies – producers, part is diaspora’s donations that allowed purchasing rest of the components”. The project was implemented thanks to the efforts of civil society, a partner NGO in Ukraine was helping out with administrative arrangements and communications. Government is trying to be involved but Antonina confesses they’d like to see them part more. “Ministry for Social Policy also provided us with administrative support, for example they issued letters of support that helped on entry to Ukraine”. It terms of arranging the work American and Canadian prosthetists got split by cases, says Antonina, so that Ukrainian specialists have a chance to see all stages and parts of work process. 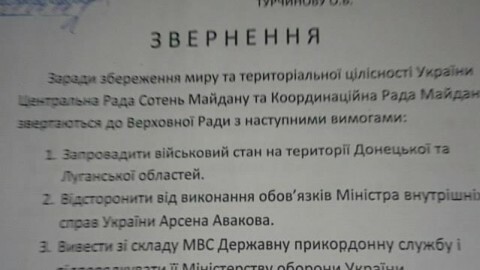 Ukrainian doctors are trying to choose the area that is of highest interest to them. “Everyone here has been so motivated to learn and excited to see new things,” says Lynsay Whelan, U.S. occupational therapist taking part in the project. Lynsay currently employed with a private company used to work as occupational therapist in the U.S. army with American soldiers and their prosthetic teams. “That’s how I really got interested in working with prosthetics,” explains Lynsay. “I’m passionate about it, I wanted to come and share my experience to make it better here,” she continues. 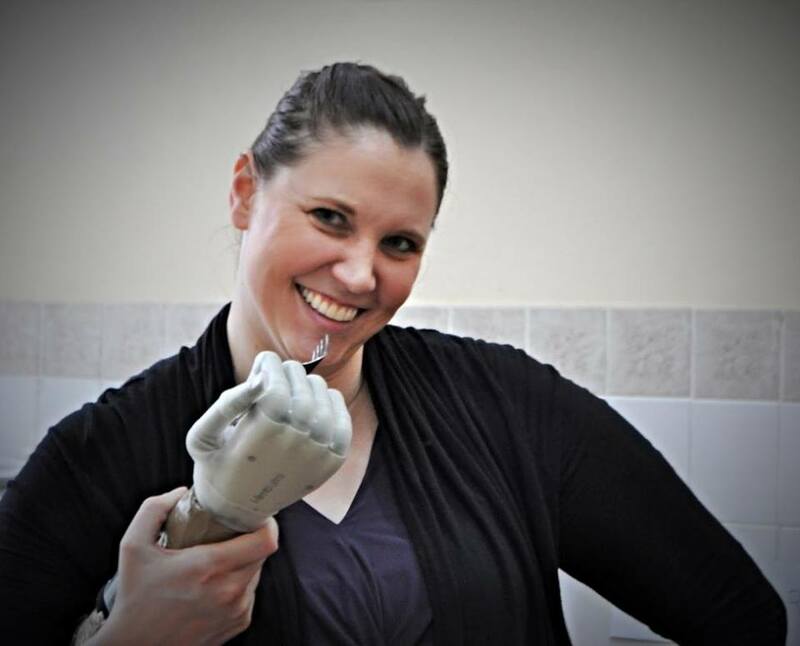 Lynsay’s part of work comes into play both before and after the prosthetic device is ready. “Before they [patients – edit.] get it we’ll do two things: make sure their arm is ready for the device, train them how to use their muscles and help them adapt to doing things with no device at all,” says Lynsay. “And then after they receive the device the training and the rehab and how to use the device.” She was transferring her knowledge and experience to Ukrainian specialists over these two weeks through hands-on learning. “On Monday we started with evaluation of all the candidates, taking measurements, making casts,” continues Lynsay. “And then we’ve just gone questions and answers through while doing hands-on.” She further explains methodology of their work and training. 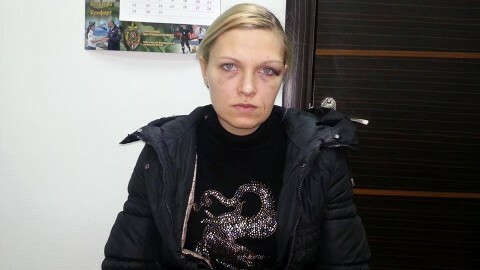 According to Lynsay there was a team of two Americans and a team of Ukrainian prosthetists and therapists working on each of the different cases. The teams were doing all the steps to get the final devices on everyone. “I’ve been working with four people going through the whole process together,” says Lynsay. “Everyone that needs an arm are the people that I’ve been working with.” There were also people coming for consultations within these two weeks. 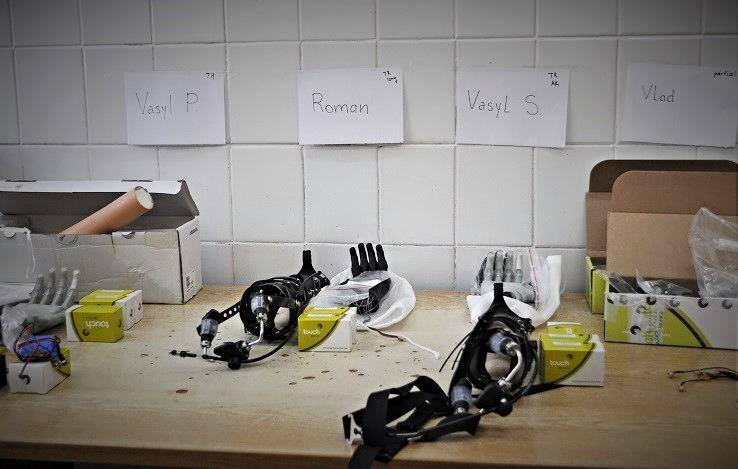 According to Lynsay Ukrainian specialists know and understand the principles applied in prosthetics but might have had not much experience of translating them into practice. “I think they’re very experienced especially in the lower limb, upper limb is not very common to see at all anywhere. Even in the U.S. our top people might not see that many arms. 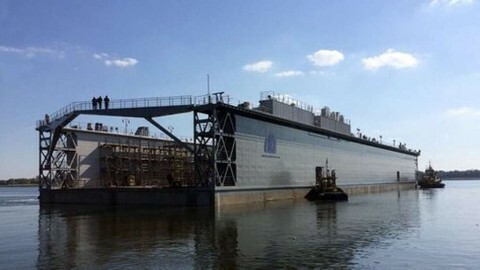 So it’s a very challenging field.” Materials and technology used by U.S. and Ukrainian specialists differ. However, Lynsay is sure, there can be solutions in both lower and higher technology. “So it’s just figuring out what fits best for that person. For example you have someone and most important thing for them is fishing. You don’t wanna fit electric (elements) on them because they won’t be able to get it wet. So it’s also matching what the person wants to do with what device is better for them,” concludes Lynsay. “I’m hoping that in the future part of the training will include training more therapists and getting the rehab side of things as well so that you don’t just give a person a device but you teach them how to use it and incorporate it into their daily life”. Additional training from manufacturers of various components is something that according to Lynsay can be beneficial for Ukrainian prosthetists. She also notes that in the U.S. more accessibility is ensured, it also reflects that all of the society embraces all those people who have sacrificed for them and is helping them feel comfortable when going out. Tailor-made prostheses may also increase the level of independence of a person. We learn it from Jon Batzdorff, San Francisco based prosthetist and orthotist, founder and director of Prosthetika while talking in the clinic’s workshop for producing prostheses. Jon interrupts his work to explain us what he is currently working on. “At the moment I was working on an arm for a man that came in this morning from Odesa. He is a person that is missing both arms – one above the elbow and one below the elbow. He can’t do eating or washing by himself.” Jon and the team were in try to do something simple and functional that would allow the man to be more independent. “But we’re making it all in one day,” continues Jon. “Because we’ve started it this morning and he leaves tonight at 10 o’clock on a train.” The team working on this challenging task includes Jon, his Canadian and American colleagues and Ukrainian technicians. “What I was very happy about is that everybody can work together, because sometimes when you come in from outside there’s a little bit of defensiveness or pride […] but everybody is working together, there is no wall, even from the first day,“ says Jon adding that a language barrier is something that is not in place to hamper the team work not only thanks to excellent interpretation services they get. “So much of what we do is to find if something’s working or not or if it’s uncomfortable, it doesn’t take words, you can look at somebody’s face and you can find out whether it works and whether it’s a problem.” According to Jon people that are injured are part of the team playing an active participatory role. “Because it’s difficult work to use a prosthesis. They have to learn it, they have to work with us,” he explains. He did not have any expectations before coming to Ukraine on this mission but working for a long time with injured he was prepared to see defensiveness on their side as losing a limb is always a trauma. However things turned to be quite different: “We’ve gotten to be friends very quickly, working together and joking together.” According to Jon this two-week experience is not only important for its participants but is a step forward in a wider context for development of prosthetics in Ukraine. “This was one project in one location and it needs to be scaled up,” says Jon. “People see what’s possible. And now the word will spread that it’s possible. And that it’s possible here, in Ukraine […]. You can see that anybody can use this and that it can be done in Ukraine,” that according to Jon is key. “There are people that get good technology here but they get sent abroad to get this. And this is not a good thing. If you have a certain amount of people and they want something good and then they go abroad to get it, the problem is when they come back nobody knows how to do the adjustment and the repairs. And they have very big problems when they get back. So it’s a very short-term solution. Maybe one-month or maybe six-month solution for that person. So thinking about the country and the future it’s important to do education here and to develop local ability to do this,” concludes Jon adding that Ukrainian prosthetists taking part in the project will be asked to do follow up on the patients treated in course of these weeks. Roman is one of the five patients taking part in the project. We caught up with him as he was leaving, impatient to try his newly made arm prosthesis that would not only allow him to perform basic functions but also to train in the gym with a barbell and lift weight thanks to the special grabbing unit. “I wanted exactly the one like this,” says Roman. “While everyone told me it’s not possible.” Roman was anxious to try it out that day so that if there are any drawbacks they could be adjusted the next day. Roman got injured during Euromaidan, he agrees to briefly tell us his story: “I was lucky the whole day, later in the evening at the crossroad of Instytutska and Khreshatyk streets I caught fire. 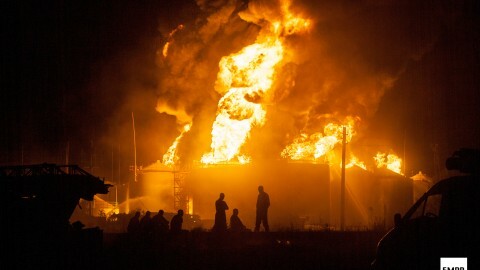 Kind people extinguished the fire and took me to hospital,” says Roman. After 4 months in hospital, numerous surgical operations and general anesthesia applied around 60 times including for dressing made each 2-3 days, Roman is making his way back into normal life. “Why would I need a trainer [in the gym], I’m not training for the first day,” he answers abruptly when asked on his sports training with the prosthesis. “I don’t need rehabilitation. Rehabilitation is what the sick need,” he adds. 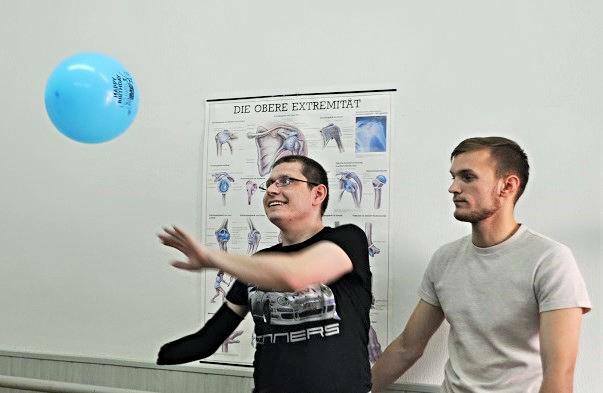 Yuriy Metko, rehabilitation specialist from Lviv, casts light on what rehabilitation is like for someone who is learning to use a prosthesis in Ukrainian realities and as presented by foreign specialists. Yuriy is one of the nine Ukrainian specialists taking part in the project. He is mostly working alongside Lynsay, occupational therapist, and Don, physical therapist. “He teaches people to use prostheses for lower limbs, Lynsay – for upper limbs. They got these as two separate professions while we got one – rehabilitation specialist,” says Yuriy. “I was asking Don about some issues as we are doing them in a different way,” he continues. Don, in possession of over 25 years of experience in the field, often offers solutions deriving from his practical experience that in turn might be different from theory. “We’ve been discussing [with Don] a bit: what’s best in certain periods of time and what’s best to do later, what muscles to work on, what means should be used to prepare the residual limb for a prosthesis, first steps when instructing the person to use the technical means.” Yuriy considers this learning opportunity a valuable one, however identifying the extent of its use could be only made further in practice. “We got lower limbs [prostheses] function in the same way while as to the upper limbs we have not come across the touch bionic hand. For upper limbs it’s mostly cosmetic prostheses that are being made.” Therapists, says Yuriy, accompany the patient throughout the entire process while the prosthesis is being made. 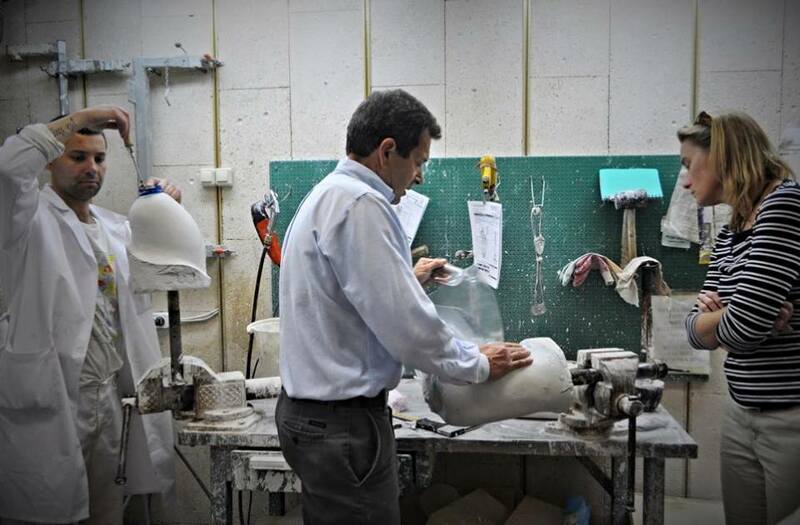 “To teach how to use a prosthesis is of same importance as to make a quality one,” he adds. “What they do first is they choose the muscles to be connected to electric cords. As the prosthesis is being made, test socket, they teach a person how to make controlled moves with certain muscles. When the test socket is ready, we put it on and continue training in various positions. According to Yuriy one of the biggest problems Ukraine has got in rehabilitation is “the lack of formed multi-disciplinary teams.” Yuriy also notes work of Canadian and American prosthetists is split in a clearer way – “everything is divided, you do one type of work I do another one.” Such type of approach adds to achieving the result in an easier and faster way. In Ukrainian realities, says Yuriy it is very often that “the rehabilitation center is [located in] one end of the city and the orthotist technician in the other.” After the prosthesis is made it would be great if the specialists gathered in one place as the person might discover he/she needs adjustment while going through a rehabilitation course with no technician around who can do that. “We are now in try to set up such multi-disciplinary team in the Lviv [military hospital], the overall results are not bad as many people from across Ukraine are asking to undergo rehabilitation with us,” adds Yuriy. With first visible achievements and loads of things to be done further Antonina is determined to continue the project. 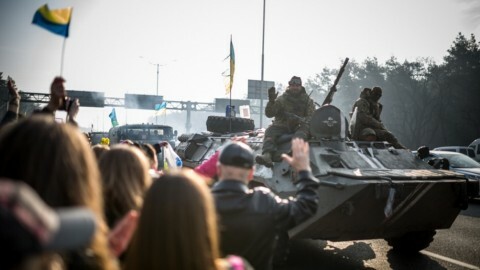 Its further details have not yet been decided upon as they largely depend on what the U.S. and Canadian specialists will agree to with their Ukrainian colleagues, on what the latter would like to learn. Depending on the content it will be decided how much time is required for preparation to the next stage. “It is not going to happen in two months, may be in a half of the year, a year. We also think that it [the next session – edit.] 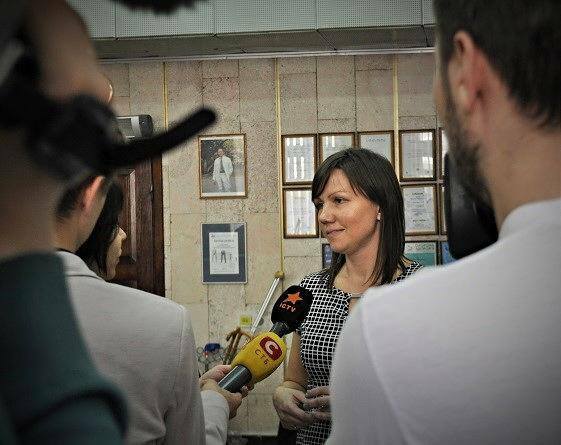 will take place not in Kyiv but probably in Lviv or Kharkiv.” Antonina is also hopeful that Ukrainian specialists who took part in the project will use the newly-gained knowledge and skills to develop prosthetics in their home towns. “Their enthusiasm is very high, they are very interested”, noted Antonina. 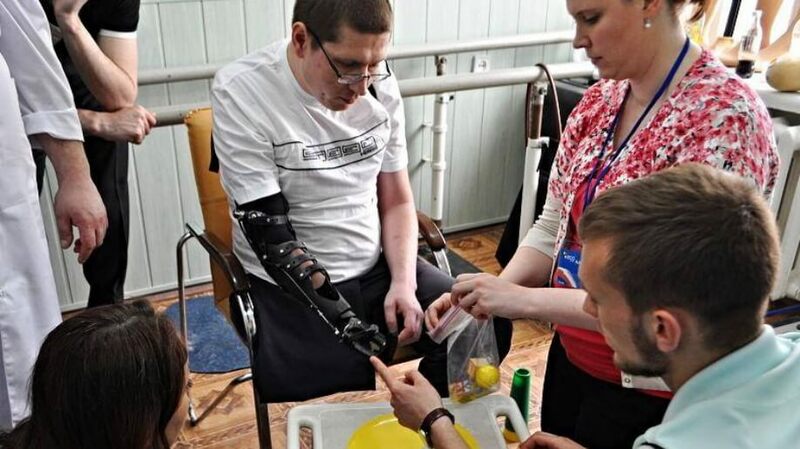 To support the Ukraine Prosthetic Assistance Project check out the initiative’s web site.